Khomas is an exotic region of Namibia. Home to more than 340,000 people, most of whom are in the capital, Windhoek, it is the largest populated area in the country. The Khomas Region offers you exciting adventure, amazing wildlife, and intriguing history. The top attractions include Namibia Craft Centre, Katutura Township, and NamibRand Nature Reserve. Cheap flights to Khomas are available for a limited time, so get ready for an adventure! Windhoek is home to Eros Airport (ERS), which is a 10-minute drive from the city centre. Eros Airport serves international airlines such as South African Airways and Air Namibia. Popular flights to Khomas are available from Johannesburg and Cape Town. The flight duration from Johannesburg to Khomas is approximately 9 hours and 15 minutes. A wealth of natural landscapes is waiting to be explored! Discover the far reaches of Sossusvlei, climb Big Daddy Dune, and explore the depths of the Arnhem Caves. 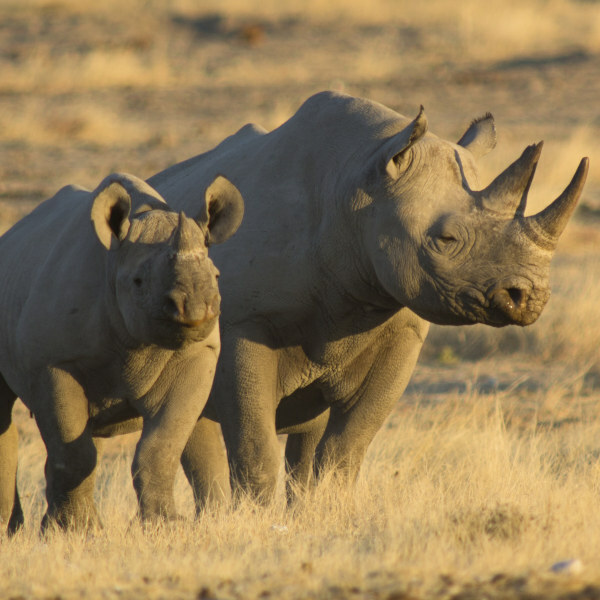 The Khomas Region shares in Namibia’s incredibly diverse wildlife. Spend time outdoors and catch sight of various creatures, including springboks, wildebeest, and kudu. Visit the Katutura Township in Windhoek to learn about the local culture. Admire the more-than-a-century-old Christuskirche, and discover the memorial of Heroes’ Acre. The Khomas Region has a hot semi-arid climate with a little rain throughout the year. There are two distinct seasons: dry (May to October) and wet (November to April). The dry season offers daytime temperatures ranging around 23°C, but do get hotter towards the end of the season. The wet season starts with temperatures above 30°C but gradually descends to the mid-20s. The best time to visit Khomas for game viewing, sightseeing, and outdoor activities is from May to October. Take note that this is the peak season in Namibia, so make sure you’re ready for bigger crowds and higher prices. For cheap flights to Khomas, visit between December and March. An unforgettable adventure, unique culture, and much more awaits with a visit to the Khomas Region of Namibia. The region is rich with spectacular landscapes, all further enhanced by the minimal air and nearly non-existent light pollution. Definitely a great place for stargazing on the great expanses of the nature reserves, deserts and canyons. 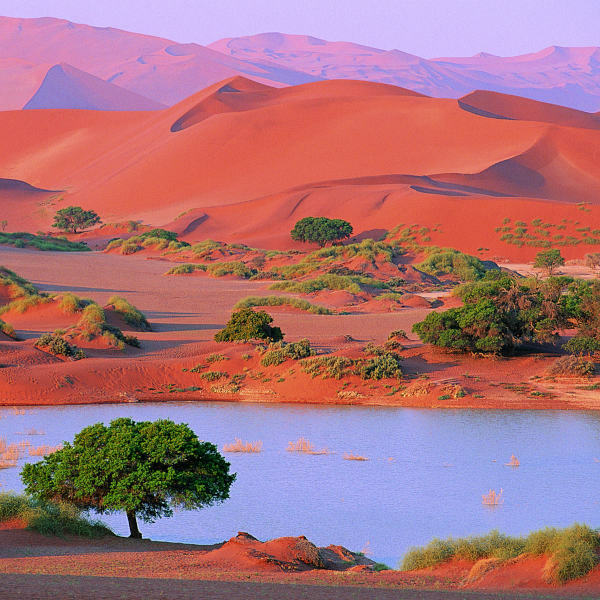 Top locations include Sossusvlei, Big Daddy Dune, Namib Desert, and NamibRand Nature Reserve. A deeper exploration of these outdoor areas will reveal many fascinating wildlife species. Head to the Arnhem Caves and Rest Camp (the longest cave in the country), which is home to six species of bat, such as the giant leaf-nosed bat, the long-fingered bat, and the Egyptian slit-faced bat. If you spend enough time in the NamibRand Nature Reserve, you’ll eventually spot oryxes. Enjoy an adventure along the Khomas Hochland Hiking Trail and keep an eye out for kudu, waterbucks, zebras, baboons, and more. The Khomas Region is not all just nature and wildlife since it is home to a number of cities and towns, including the country’s capital, Windhoek. Take a walk along the streets and see the well-dressed ladies of the Sidadi Cultural Group perform a folk song and dance to the rhythm of a whistle. Experience the destination’s shopping scene at the Namibia Craft Centre. 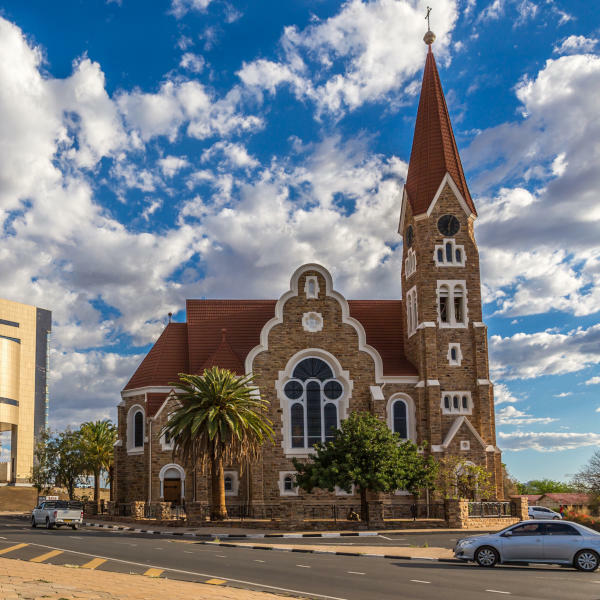 Discover historic landmarks such as Christuskirche, and discover some intriguing facts at the National Museum of Namibia. Compare several airlines and book your cheap flights to Khomas online at Travelstart! South African passport holders do not need a visa to enter Namibia. Simply make sure your passport is valid for six months after you depart from Namibia and that it has empty pages for entry stamps. If you do happen to be coming from another country, you will need to have a transit visa for travelling through that destination. While the Khomas Region is relatively safe, it’s best to take precautions all the same. You should consider taking out travel insurance to cover theft and medical expenses. Avoid flashing large amounts of cash or displaying your valuables, as pickpocketing does occur. While the townships are of interest, don’t stay around after sunset. If you’re driving at night, don’t head outside of the city as wildlife and stray livestock may suddenly appear, which pose a serious hazard. Learn about the local laws and customs before you arrive. Should you be travelling from an area where yellow fever is a problem, you will have to provide proof of yellow fever vaccination. Certain parts of Namibia are at risk for malaria, so take care to guard against infection. You should also consider getting immunised against hepatitis A, typhoid, hepatitis B, and rabies. Other routine vaccinations are measles-mumps-rubella, diphtheria-tetanus, pertussis, polio, varicella, and your yearly influenza shot.